Recycling is almost non-existent where we live. When my nephew became publisher of the local paper back in the summer, one of the first things he did was start recycling newsprint. But to recycle glass, cardboard, plastic, and other items we have to haul it the thirty miles to Birmingham. We recycle as much as we can, but cardboard is a hard one. We're mindful of landfills, and we're aware of polluting the atmosphere, but we can't eat it...not yet anyhow. 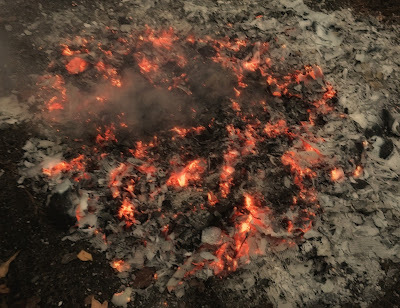 So, I wait for a windless day, and I burn the cardboard in our burn area at the edge of the yard. We stopped burning cardboard back in the summer long before the governor declared a state of emergency and instituted a burn ban. I took our cardboard to the tool shed and stacked it neatly in the corner at first. But after almost five months, whenever we had cardboard, I'd open the door to the tool shed toss the cardboard in and slam the door before it tumbled out. It's rained almost every day this past week and today's headline read, "Governor lifts burn ban." This evening when I got home, the air was still thick as a curtain with misting rain, but I piled up a mountain of cardboard and began to burn. It took about 10 trips between the shed and the burn area, but I finally rendered it to gray ash. I then took a shovel and tossed damp soil on the pile to prevent it from spreading though I felt sure it wasn't going anywhere. Afterward, I went back to the shed, and it had miraculously tripled in size on the inside. I guess you can tell by this entry that it's a slow news day in Empire. How sad that recycling is so difficult for you. I hope over time that changes - and love that you have had sufficient rain for the burn ban to be lifte. You'd be in big trouble doing that is Jersey, of course the recycle area is 2 miles away so I bring the cardboard regularly...I'd rather burn it. Setting the world on fire again Rick! We've had recycling here for several years now and have had a burn ban in the city for years. I can remember when we used to burn piles of leaves in the fall, but that isn't allowed at all here. Those out in the country can still burn and do, but thankfully leaves and cardboard are taken care of by our city workers. I'm glad the burn ban was lifted. We are very lucky that we have recycling here but I still save cardboard boxes and I place them along the edge of the cedar hedge under the branches to control weeds as the garden is next to the hedge. The cardboard disintegrates in the soil. I make sure the cardboard over-laps so weeds don't get sunlight. It helps a lot. Wet newspapers also woks well to control weeds. I wouldn't suggest using cardboard boxes in a drought though. That would be a fire hazard. We have trash pickup here in Deltona. Jumping thru hoops to get the 'can' wasn't easy. I was surprised when we did not get the recycle 'container also'. Some have it some don't. Still haven't gotten the answer. In my opinion we need more REAL incinerators that work and also produce some electricity. JMNO. Also I would think cardboard/pasteboard would be good for a land fill. 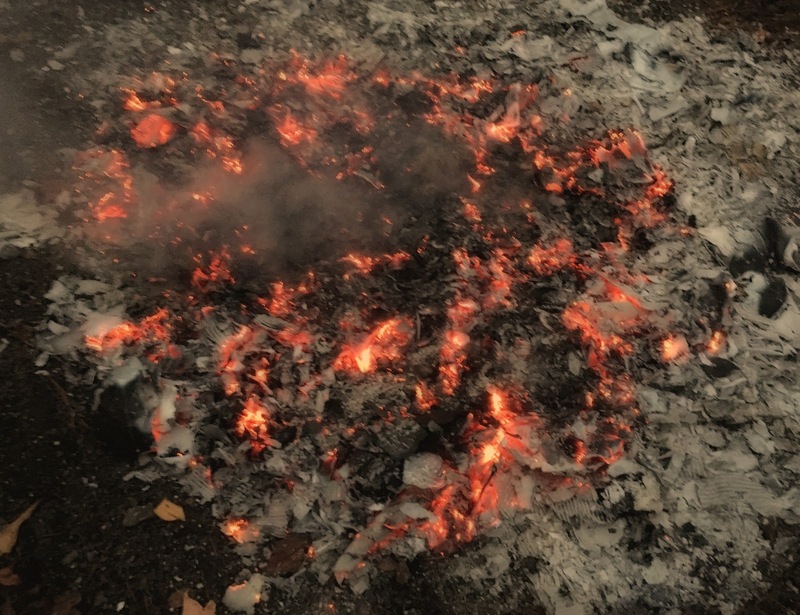 We are no longer permitted to burn debris here in Oregon, at least in the Portland metropolitan area. We have a city trash can and a city Recycle can that we haul to the side of the road on Mondays for pick up. At first I didn't want to recycle but now I can imagine not doing it. We can recycle cardboard, paper, glass and plastic but we can not recycle Styrofoam which I thought could be recycled. hmm. I remember when every house here in Los Angeles had a backyard incinerator!! It must have been nice to be able to burn anything after the dry fires you've had this year. That is news all by itself.